Come and experience the rush of hunting wild boar in its natural habitat in WildBoar Wilderness. Snowflakes are slowly drifting down onto the already heavily laden cedar branches. There is a deathly silence in the dark forest ... but he is there ... you know it - you can feel it. Somewhere beyond that thick wall of brushes lurks the beast you have been tracking so painstakingly carefully. A wild boar! Suddenly his growl shatters the silence! You feel the rush as the pounding of your heart rings loud in your ears. Your rifle whips up to your shoulder. Where is he? Your eyes hastily scan the bush - where is he?! There! He puffs steam out his nostrils and angrily paws the ground. The scope magnifies the beast so close you can see the black fury in his eyes. You gasp! He has been studying you all this time! Your sweaty hands are trembling as your fingers start slowly squeezing the trigger. But - a crash of thunder and breaking branches...... !!! 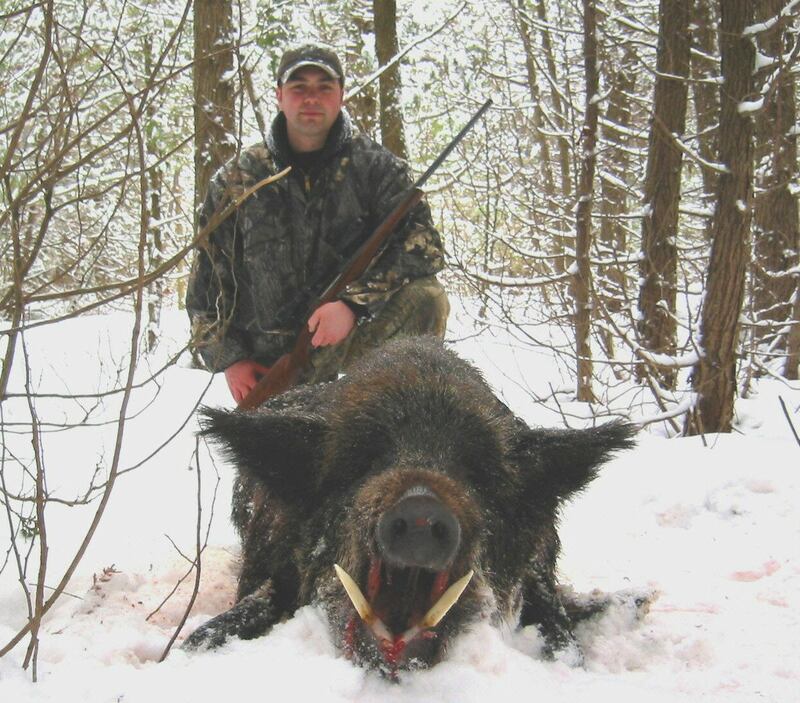 Stalking, preferred by most hunters, is exciting and tense for hunting a wild boar. Sometimes finding a good spot to hide on a well used trail and waiting works well too. 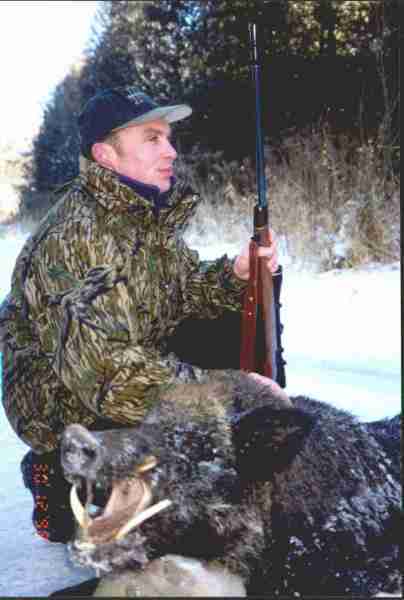 The wild boar may come along downwind unsuspecting for a good chance at a shot. There are also lots of big trees if one wanted to set up a tree stand for the hunt. The lush forest provides natural food everywhere, and with the winding creek providing access to drinking water all through the grounds there is very little chance of seeing them drink. Whatever your preference we know we can provide you with an exciting and pleasurable hunt in unique "Borassic Park". You will be tracking and hunting wild boar in variable bush, with a creek running through it. WildBoar Reserve, well known for world class trophies, is unique in character in that it allows you to hunt in a perfectly natural, undisturbed environment, large enough to challenge your skills for an adventure lasting a complete day. Your prey is genuine German wild boar from the Black Forest in Germany and very wild, mostly a moving target as it takes off through the bush. 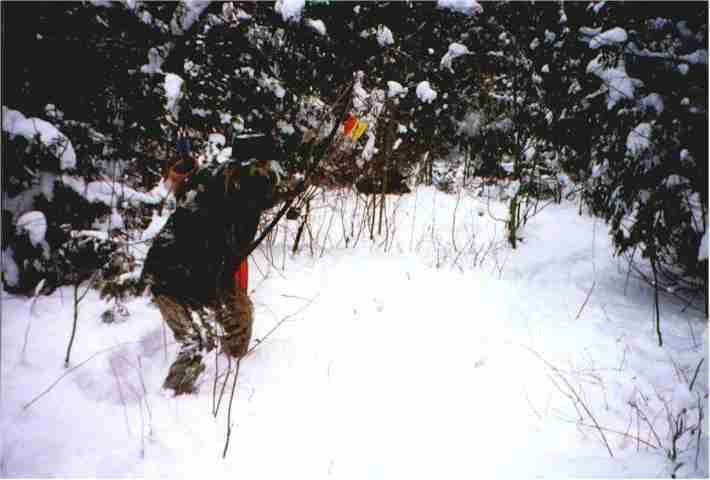 Safety: To ensure that your hunting experience with us is a happy one, we emphasize hunting safety. For the new hunter, we can provide help, tips, and full guidance. WildBoar Reserve is a private hunting ground and therefore there is no off season. Hunting is year round. Hunting permits or game tags are not required. Our guides have many hunts under their belts and have learned many techniques which have proven successful in the hunt should you require their assistance. Use a rifle, shotgun, muzzle loader, bow or crossbow. For rifles we recommend a .30 caliber or up. For shotguns, use slugs or sabots only. Muzzleloaders are proven to be very effective. For archery, you will need a broadhead, the sharper the better. Whatever your choice, we promise that you will leave WildBoar Reserve with incredibly delicious wild boar meat, your trophy, and the memories of an unforgettable hunting day! Book winter hunt of swift BigTusk boars in Borassic Park now and have impressive wall mounts to remember the challenger.